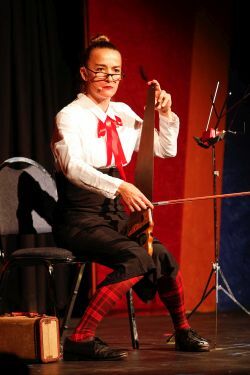 Aileen has been described as one of the most experienced street performers in the world. She’s also been described as gentle and charming as well as amazing and anarchic. Another writer used this phrase “[the] sweet charm of Drambuie and the leather voice of a sheep”. Could it be that all of these descriptives are simultaneously true? When she joined us at Moisture Festival we discovered that, yes … they are all true and there is much more. Aileen Wilkie, is a Scottish native and … oh yeah … she juggles, rides a tall unicycle and knows how to handle a crowd. She takes what she does seriously enough to have completed her studies in Paris under Jacques Lecoq, the acknowledged master of teaching the arts of physical theater. We are thrilled to have her back for 2018!